Taught Kung-Fu by his late Grandfather who raised him out in the wilderness, Goku is very strong, very agile and virtually fearless. He'll take on any fight no matter what the odds are if he thinks that someone has been wronged. And he'll usually win. That's because Goku is not a typical eight year old. He is able to fly short distances and carries a magic fighting stick that stretches to incredible lengths.But Goku is more that just a good kid with cool hair and a great karate kick. He's a little naive which can really annoy Bulma at times! But no matter how far from his home Goku travels, the spirit of his grandfather is always with him, providing him with a wealth of knowledge that he can call upon in times of need. It's Goku's quotes of his grandfather's views and observations about the world and life in general that keep him anchored as the temptations and intrigue of the world swirls around him. That's what sustains him. His grandfather's wisdom, and about 200 pounds of food a day. The kid eats like a horse!When Goku grows up, he is still a peaceful, good natured, honest, protective, and trusting soul. He is also the most powerful warrior on Earth and the first to become a Super Saiyan (in later episodes) in over 1000 years! 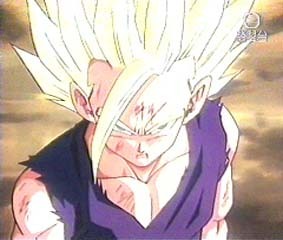 Having honed his skills and strengthened his spirit to a level never achieved by any being on Earth, Goku is able to fly, shoot energy beams from his hands, move at incredible speeds and --when in a pinch-- power-up to a fighting level so high it creates an energy aura around his body and makes him turn blond with green eyes becoming every villain's ultimate nightmare! When the Saiyans arrive, it is a total shock in more ways than one! Not only does Goku meet his deadliest foe ever--one that is more powerful than he is--he learns the mysterious secret of his own past: he is a Saiyan formerly named Kakarot sent to Earth as a baby to grow up and destroy the planet as he went along. Fortunately, when he was discovered in the wild as an infant and raised by a peaceful old wise man, his life was changed forever. A near-fatal head injury scrambled his programming and instead of growing up to become a destructive super-warrior, he became innocent and pure of heart, fighting for good! Goku is always there to help his family and friends and he is very protective of them. If he has a weakness, it is his trusting nature. Sometimes he is too trusting but Goku is always looking for the good qualities in people and can often find a spark of good when others don't see it. Goku has many powerful fighting techniques including the powerful Kamehameha wave and the KAIO-KEN which he learns from King Kai. His last and most powerful weapon is an immensely powerful energy ball which garners pieces of energy from all sources on the planet, concentrates it on one sphere and then releases it in one mighty swoop. This ball can be used only once and must be guided carefully for it can destroy the planet if used inappropriately. Goku's power level changes rapidly rising from a 330 level in the beginning peaceful episodes to 5000 after training with King Kai to 8000 when he is angry to 21000 when doing the famous Triple KAIO-KEN. And all of this is before his Super Saiyan stage! To further aid him, Goku still has the famous Nimbus Cloud and Power Pole. 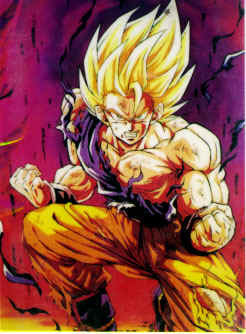 Gohan Gohan, Goku and Chi-Chi's four-year-old son, was named after his adoptive grandfather. Physically, he resembles a young Goku right down to the tail and the likelihood to become an uncontrollable raging Giant Monkey when he looks at a full moon, while spiritually, he is good and pure of heart as well. Initially caught between "wimp" and "warrior", Gohan's loss of nerve in the battle against the Saiyans costs his friends dearly. Haunted by his failure, he is determined to make up for his cowardice and volunteers to travel to Planet Namek to search for the source of the original Dragon Balls, so that he can wish his friends back to life. And he comes through in the end of the final battle as he looks at the moon, turns into a Giant Monkey and lunges toward Vegeta to fell the planet. He is the son of Bulma, a tech guru, and Vegeta, one of the most powerful fighters. We know he's somewhere from the future. At one time he saw a threat to the Earth and has now come back in time to save the Earth. Surpisingly, Trunks quickly defeats King Cold and Frieza. He also helps by giving Goku life saving medicine and tells of the Earth's future predicament. Goku's one time arch enemy, Piccolo, is the second strongest being on the Earth. He wears an extremely heavy cape as constant training for his muscles. He is renowned for his powerful energy blasts as well as his ability to split into two or four separate entities. Green like a lizard, Piccolo has the ability to regenerate any limbs that he may lose in battle. A capability that comes in handy more than once. Originally from the faraway planet (although Piccolo doesn't know this for a long time), Piccolo came to Earth and is fighting against Goku to rule the world. But when the Saiyans arrive, he's forced to join forces with Goku and the others to defeat a greater, more powerful evil. Yamcha is a powerful and feared, dark-haired warrior-thief who can call upon the fearsome power of the Wolf-Fang Fist, a karate move he uses to help him vanquish his enemies. He is linked spiritually with wolves and the Wolf-Fang Fist is a potent weapon that he only uses when necessary. Initially Yamcha seems more like a bully than a hero, but he comes around as he meets the others and becomes infatuated with Bulma. Although normally incredibly cool, confident and under control, he is preposterously shy, often to the point of debilitation, around women. When he gets older, he is anxious and willing to be trained by Kami and to join the upcoming battle against the Saiyans even though he understands that the odds will be against them. 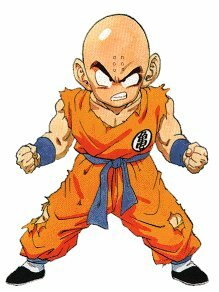 In the heat of battle, Yamcha volunteers to fight the Saibaimen instead of Krillin because Krillin has already been wished back to life by the Dragon Balls-- the Dragon Balls cannot grant the same wish twice.This good looking warrior still has an attraction for Bulma. This white-skinned, red-cheeked little prince is a devoted companion of Tien. Noble and unselfish, Chiaotzu does not hesitate to throw himself onto Nappa's back and self-destruct in an attempt to save his comrades. freezaThe mention of the name Frieza, causes dread across the universe. Frieza is feared by all as the most evil being in the universe, with no competitor being even close to his strength. He's obsessed with power and doesn't show an ounce of compassion. Frieza is desperate to collect the Dragon Balls, call upon the Dragon and gain his wish for immortality. Once he accomplishes immorality he can rule the entire universe, unrivaled, forever. 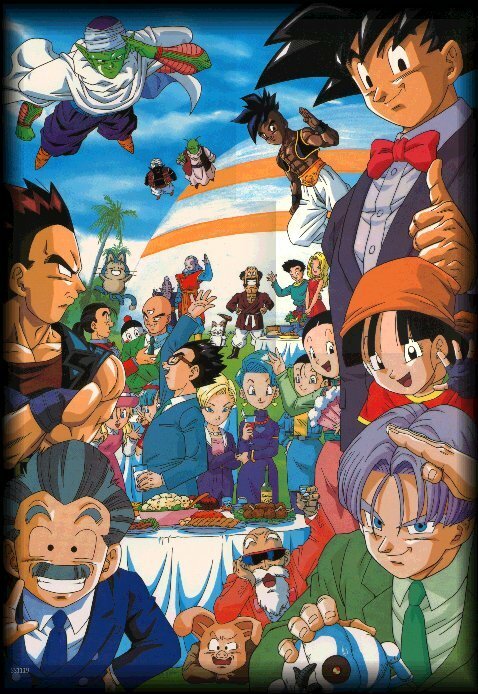 Dr. Gero is responsible for the creation of Androids 16-19. They are his most destructive creations and are out to destroy our good guys on the Earth. These androids are powerful and live to destroy. Android 16 is an experimental model. Since he's extremely strong, he enjoys destroying absolutely everything in view. After being defeated by Bulma and Cell, his pieces are collected, reassembled and programmed to fight for the good guys. Androids 17-18 are teenagers and are considered the future threat to the Earth. They force Trunks to come back to this time on Earth from the future to stop them. Android 19 is dedicated to getting rid of the good guys and uses all the weapons he can find. Androids 19 and 20 are the first to come to Earth in the Cell. Cell was created in Dr. Gero's lab as a genetic experiment. He is Dr. Gero's most dangerous creation since he contains the DNA of the some of the strongest fighters, including Vegeta, Goku and Piccolo. He was created with a scorpion-like tail that opens up to sponge the energy of his competitors, a self-destruct feature, and instructions for revenge on the Androids. Garlic Jr. is both evil and smart. He has grand plans to take over the universe. He is able to transform into a monstrous ruler. His wish is to ruin Kami, the Namekian guardian of Earth. Then he could rule the Earth. The Eternal Dragon Shenron gave Garlic Jr. immortality after he successfully collected all seven of the Earth's Dragon Balls. Since then he's been locked in a black void. Garlic Jr. is originally from the Makyo Star and his power fluctuates with the star's distance. When the Makyo Star is close to Garlic Jr. his power increases, pushing him out of the void.